Colorado Rural Broadband: Does Your Netflix Work Yet? Does Your Netflix Work Yet? Frank Ohrtman got it right with the title of his very helpful book I'll Vote for You If You Make My Netflix Work. Netflix now publishes monthly rankings of major ISPs based on their actual performance across all Netflix streams. Fiber to the home isn't an easy problem to solve in rural Colorado but it is certainly one of the tools in the suite of solutions being considered. 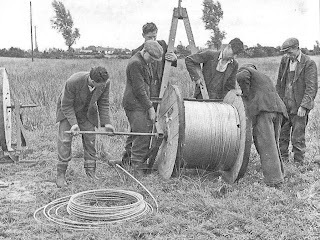 Fiber to the home does not take significantly more resources than rural electrification and we have significantly better construction methodologies than we did in 1936. ﻿"At the time the Rural Electrification Act was passed, electricity was commonplace in cities but largely unavailable in farms, ranches, and other rural places." "In the 1930s, the provision of power to remote areas was not thought to be economically feasible." "REA crews travelled through the American countryside, bringing teams of electricians along with them. The electricians added wiring to houses and barns to utilize the newly available power provided by the line crews." One of the failings of most projects being executed by the stimulus broadband initiatives is the failure to provide the means for the common household to take advantage of new broadband service availability. The focus is too highly on middle mile; last mile and on premises use are not well balanced. "At most, one outlet was installed per room, since plug-connected appliances were expensive and uncommon." A common argument I hear from the incumbents who have failed to provide real broadband to most of America and in particular to rural broadband is that they will provide service when demand exists for the service. They say the "build it and they will come" model never works. To that I say, "Except for when it does." Municipalities, counties, regional governments, the federal government, and others need to step up to the plate and facilitate the deployment of true broadband to all Americans.